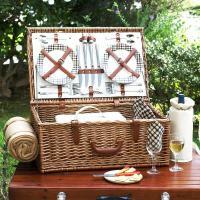 What could be more romantic than a picnic in the park, sitting on a red-and-white checkered blanket, sipping wine and enjoying the beauty of the sunset? 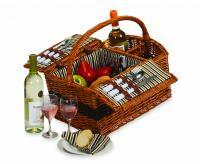 Make your picnic time with your loved one a moment to remember by bringing food and fine wine in a wine picnic basket available from Picnic World. 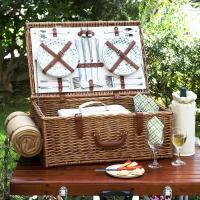 Don't fumble about trying to carry a bottle of vino and wine glasses to your favorite picnic spot without breaking a glass or spilling your pricey wine on the ground. 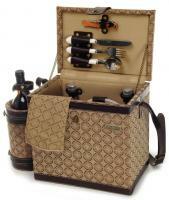 And don't get there only to realize you’ve forgotten the corkscrew! 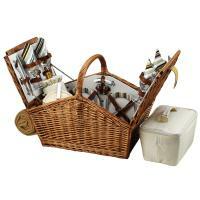 A wine picnic basket stores everything you could possibly need for a fantastic picnic. All wine picnic baskets and totes are made from quality materials that are comfortable to carry by hand or on your shoulder. 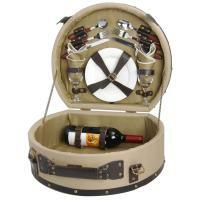 Inside, you will find wine holders, compartments for wine glasses and a corkscrew, and enough room to carry food and anything else you may need for a wonderful time enjoying nature at its finest. 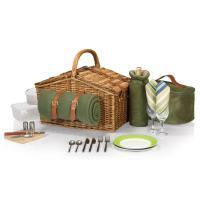 Straps of soft leather are sturdy enough to hold your items without breaking them, yet are easy to use when you have to quickly pack the wine and glasses if your picnic gets rained out. 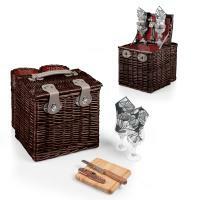 Enjoy the unique styles of wine picnic baskets offered at Picnic World. 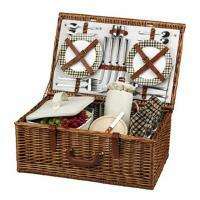 There are totes, traditional baskets and even wine barrel-shaped baskets to choose from that can set the right mood. 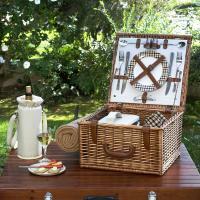 Our baskets can hold one bottle of wine or two bottles if you are spending the day enjoying the outdoors with a larger group of picnickers. 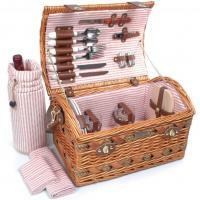 We also have wine picnic basket supplies such as cutting boards when you want to serve fruit, cheese and crackers for a light meal. 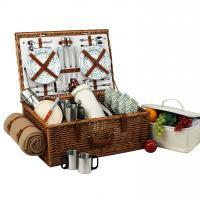 So when you want to have a nice, romantic time out in nature, get your wine picnic basket from Picnic World. 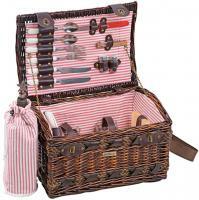 You will find yourself planning even more time outdoors when you know you can easily carry all your picnic items to your favorite picnic spot. 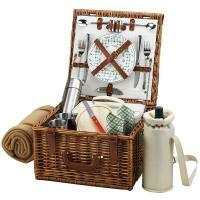 The size of the basket was great, however, I was truly disappointed with the quality of the items inside as well. The cheap glasses, the less than dollar store quality silverware, and the plates. The straps for the glasses were not sufficient to even hold a real wine/champagne glasses, actual dessert plates would not fit (straps too small). 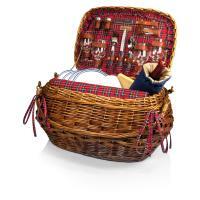 The basket a great size fit everything however it uncomfortable to travel with. 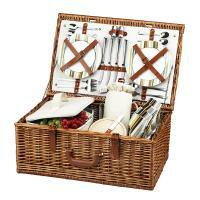 Attending diner en blanc still can't find a right size cart or trolley for it. Please explain basket size. 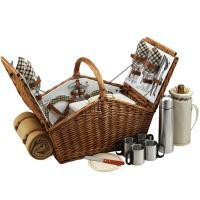 This is a very pretty basket, with nice plates, wine glasses, and utensils. 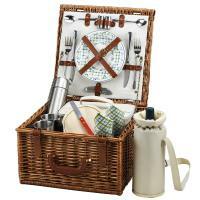 The only reason for four stars is that the compartment for food isn't very large. 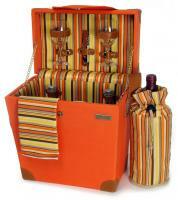 But there is two compartments for drinks, etc. overall, I'm pleased with this basket. 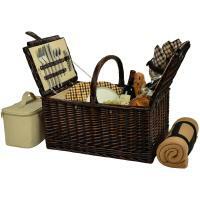 This basket is great! 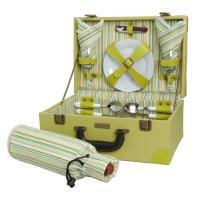 It's light weight to carry, yet durable. It's spacious. 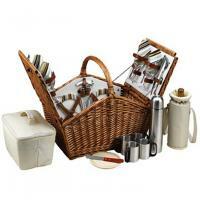 It contains real glass plates, wine glasses, utensils and wine opener. I received lots and lots of compliments at my event. 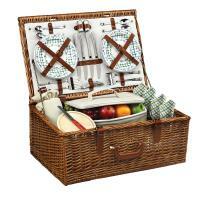 I received this picnic basket for a Mothers Day gift! 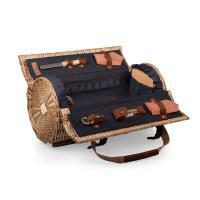 It is absolutely lovely and I look forward to taking it to wineries and other family outings. 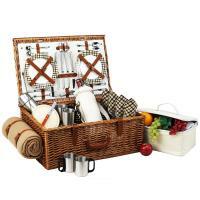 Picnic Basket Buying Guide - With hundreds of styles and colors to choose from, picking the right picnic basket is tough. 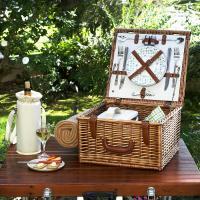 That's why we've assembled this fundamental picnic basket buying guide.